Will Employee Conflict Ever End? Yikes! is that Beverly and Angie at it again? You can always tell because the desk drawers close a little harder, the phone is hung up a more abruptly and there is that bad smell of tension in the air. What happened this time? You are wondering what you can do to help resolve it so that business can get back to running smoothly. There is not one workplace in the world that does not have some sort of conflict between co-workers or staff and management. Where there are people working together there will be people issues and we just need to realize this and find better ways to work through the issues. There is something that we can do to make these situations resolve quicker and happen less often. 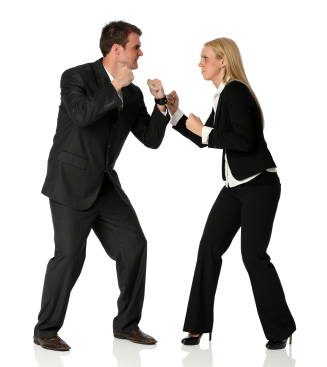 The office can set up a standard for “Conflict Resolution” that everyone adheres to. 2. All complaints or issues need to be in writing along with a possible solution for the problem. These can be spoken, but before verbalizing the complaint everything needs to be written down and reviewed. The reason for this is that people will take more time to really think through the issue if they need to write it down and sometimes they realized that this issue is not that important or big and can be handled without involving management. If it is something that management needs to receive then they get to review the issue and think on it for a day before taking any action, if action needs to be taken. This will give them time to really think through the issue and come back to the person who placed the complaint with any questions before moving on. 3. Management or the business owner needs to respond to the complaint within 24-48 hours (sooner, like right away if someone could be injured or is being threatened). All parties involved need to be able to share their view and ultimately the best way to resolve the issue is to bring all parties together knowing they are going to discuss the issue and possible ways to resolve it in a non-threatening environment. This means that everyone needs to have all information about the issue at hand prior (at least a day) before the meeting, this way no one is caught off guard and all parties have time to review and prepare for the meeting. 4. The ultimate goal needs to be resolution of the issue so that it does not happen again. However this needs to happen will be determined by many factors, i.e., how many times has this same issue happened, were there warnings given, if the parties involved are willing to work through the issue in a positive way, were there any threats, discriminations, or abuse. Certain issues cannot be tolerated and you need to make sure that you know your state laws so that the correct steps can be taken without recourse on the employer and there is protection for all involved. Conflict and problems will always arise in the business, it is how we set up the process for handling them professionally and quickly that will make the difference and allow for the business to have fewer interruptions. This entry was posted on Thursday, August 4th, 2016 at 8:00 am by Tina Del Buono, PMAC. Filed under Business Owner, Co-worker Problems, Ethics, Goal Management, Happiness, Leadership, Manager Topics, Motivational, Problem Solving, Self-improvement. You can follow any responses to this entry through the RSS 2.0 feed. Both comments and pings are currently closed.